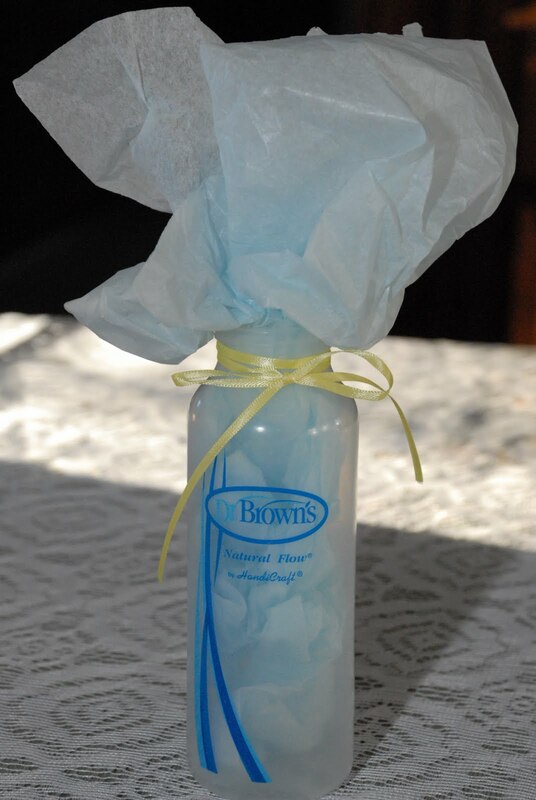 I was able to snag a bunch of used Dr. Brown bottles for just the cost of shipping through http://www.diaperswappers.com/. BPA free, in good shape, and less than $2.00 a bottle! I told the mama-to-be about them so she could take it off of her registry as they’ll be a gift to her after they serve their decorative purpose at the shower. 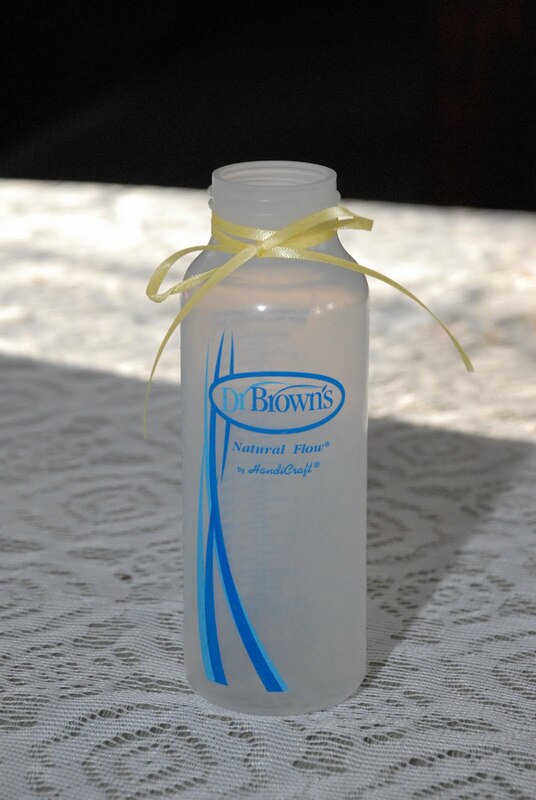 Tie a reusable ribbon around the bottle’s neck. Instead of buying new ribbon, I just used the same ribbon that had been tied around the washcloth/reusable wipe roses I received from I Dream In Green. This is a great thing to do with your already used tissue paper that’s wrinkly and has holes or tears. Just take one piece and start stuffing it into the bottom of the bottle until you have about 1/4 of it left sticking out of the top. 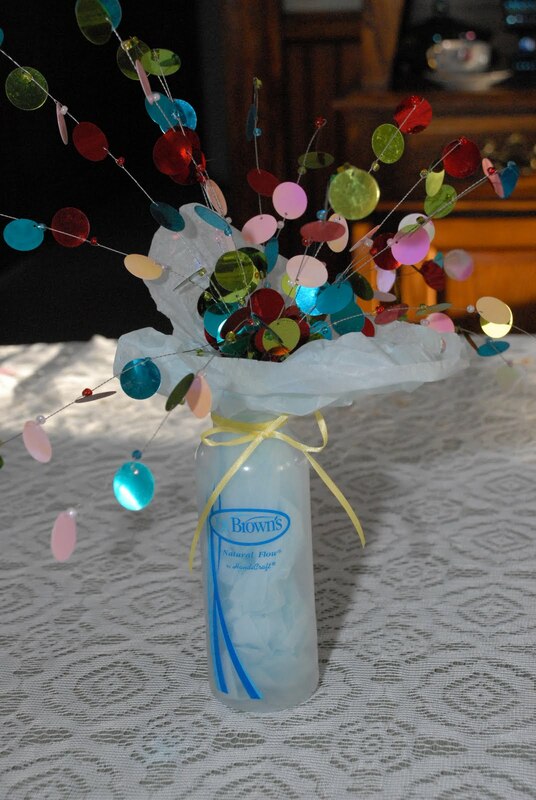 Lastly, stick a topper of your choice down into the bottle and tissue paper. I was able to find these circular exploding decorations on sale for 90% off after Christmas last year. I bought 8 of them and tucked them away in my gift closet (I buy things on discount throughout the year and store them in a cupboard until I use them). The great thing about them is that they cost me $.40 each and are so colorful that I’ll be able to reuse them for any sort of party or shower event that needs decorations! If you can’t find some inexpensive topper like this, you could use balloons on sticks or weighted down from a string, big old fashioned lolipops, or cute animal silhouettes (think: Peeps) cut out of scrapbooking paper and mounted on a dowel craft rod.